Time for making amazing pure veg fare in The Kitch has become scarce; but that doesn't mean it's completely disappeared. For now, I have an impressively simple recipe for rich, moist, chocolate cupcakes. It's amazing what you can come up with when you're short on time and ideas, just by looking around your pantry. I found some dark cocoa powder, a brand new package of sweetened coconut flakes and everything I needed to whip up cupcakes and frosting. I'd be willing to bet you have most, if not all, of the ingredients floating around your pantry, too. You can make these into extra special treats (as if they weren't special enough) by turning them into mini layer cakes. I'll explain how easy it is below. To start: Preheat the oven to 350°F and line a jumbo muffin pan with paper liners (if you don't have a jumbo pan and liners, these can be made as regular-sized cupcakes. Just subract some of the cooking time). Make the batter: Whisk together the almond milk and vinegar in a large bowl, and set aside for a few minutes to curdle. Add the sugar, oil, and vanilla extract to the soy milk mixture and beat with a handheld mixer until foamy. 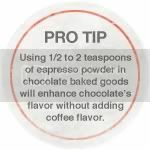 In a separate bowl, sift together the flour, cocoa powder, baking soda, baking powder, espresso powder and salt. Add mixture in two batches to the wet ingredients and beat with a handheld mixer until no large lumps remain. Fold in the coconut flakes. Bake the cupcakes: Pour batter into liners, filling three-quarters of the way. Bake 25-30 minutes, until a toothpick inserted into the center comes out clean. If making regular-sized cupcakes, bake for 18-20 minutes. Transfer cupcakes to the kitchen counter or a cooling rack and let cool completely. Make the frosting: Beat the shortening and Earth Balance Buttery Spread together until well combined and fluffy. Add the sugar and beat for about 3 more minutes. Add the vanilla and almond milk, beat for another 5 to 7 minutes until fluffy. Add the coconut flakes and beat briefly, just to mix in. Once the cupcakes have cooled completely, Frost the tops generously with frosting. To make mini layer cakes: remove paper wrappers from cupcakes. Slice each cupcake in half and place bottom part sliced side up on a serving plate. 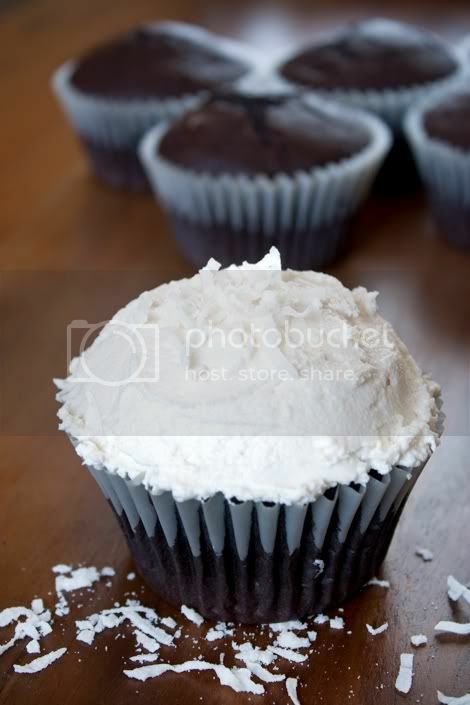 Add a generous layer of frosting on top, and top with top part of the cupcake. 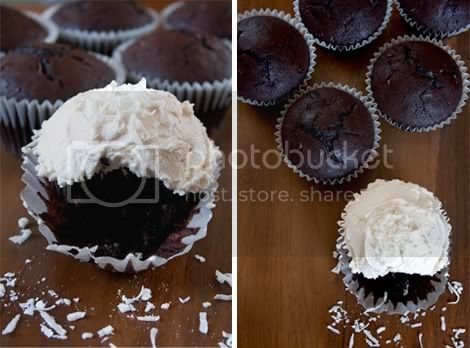 Add frosting to the top of the cupcake and spread until top is covered, pulling down onto the sides. Add more frosting to the sides and frost entirely, just like you would frost a cake. Garnish with a sprinkle of coconut flakes, and serve. Thanks, Rae! I'm so glad they turned out well for you and you liked them.